New safety regulations have derailed a Thomas the Tank Engine themed event which has been hosted by an historic steam-powered railway for 24 years. The "Fat controller" will not be entertaining families at Dorset's Swanage Railway in February because he has not undertaken a training course. Hit Entertainment, the firm which licenses Thomas, introduced the rules, after conducting an audit. But Swanage Railway branded the rules "over the top" and "bizarre". Dave Green, assistant to the general manager at Swanage Railway, said: "It's not just one regulation, there are many within the new contracts which cause major concern. "We've been doing Thomas the Tank Engine events since 1984 on the Swanage Railway. We have always had a very high customer satisfaction resulting from it. "But these new rules are over the top." The railway was sent the new contracts which, it said, arrived two days before Christmas. It said it found "impossible to comply with these regulations" because of the short time-scale between then and the February event. 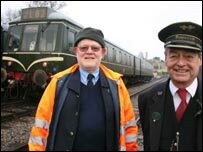 Roger Woodley has played the Fat Controller character for about 20 years, including five years taking the role for Swanage Railway's events. Under the new contract, he would have to embark on a training course to "achieve a high level of performance". Everyone associated with the event would also have to undergo Criminal Records Bureau (CRB) checks as part of the new regulations. "It is bizarre," said Mr Green. Mr Woodley is CRB checked as part of the railway's own child protection policy. He added: "We have a full child protection policy on Swanage Railway which has been arrived at with full cooperation with Dorset Police and Dorset County Council." The railway has still not decided whether to host the "Thomas" event in October. It is holding a family fun event with face painting, circus performers, vintage bus rides and a magic show instead, from 16 to 24 February. A statement from HIT Entertainment read: "Recently, HIT Entertainment conducted an audit across all 'Day out with Thomas' licensees in the UK. "As a result of this audit and the company's change in strategic direction for these events, a small number of licensees have not been renewed."